There are a couple of great mail in rebate offers right now for Filtrete Products. 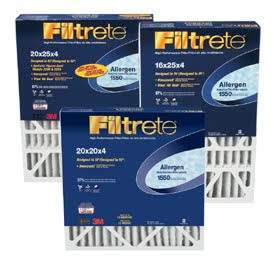 Filterte Furnace Filter: You can get $3.00 back by mail on your filter purchase from December 15, 2009 through March 15, 2010. I know that previously posted this, but I wanted to be sure that you didn’t forget! Filtrete Water Filtration Products: You can get up $7.00 back by mail based upon your purchases made from December 1, 2009 through December 31, 2010. So there is LOTS of time to act upon this offer!